It’s the strip that started it all! Meat-crazed canines won’t believe their noses when they get a whiff of these bacony, mouthwatering dog treats made with real meat as the #1 ingredient. Each meaty bite smells like sizzlin’ bacon, taste like savory bacon, heck it’s even made with real bacon. 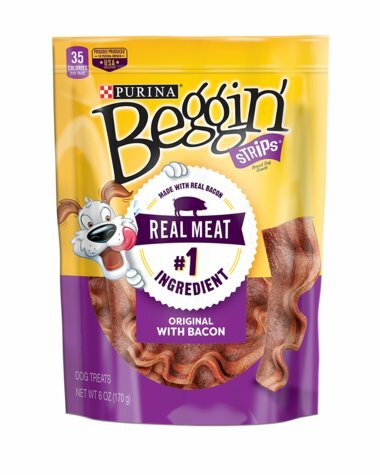 And best of all, every Beggin’ Strip is proudly produced right here in facilities the USA. Pork, barley, oat meal, brewers rice, soybean meal, ground whole wheat, glycerin, sugar, corn gluten meal, wheat flour, wheat gluten, water, ground yellow corn, bacon, soy protein concentrate, salt, phosphoric acid, natural flavor, sorbic acid (a preservative), bacon fat (preserved with BHA and citric acid), natural smoke flavor, calcium propionate (a preservative), Red 40, Yellow 5, Blue 1, Yellow 6.